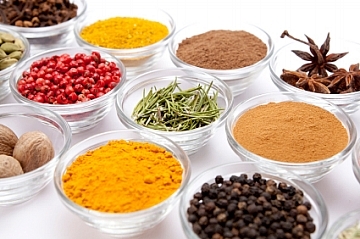 Cooking with herbs and spices is what gives food flavor and makes it taste great. Have you ever tasted something that really didn't taste good? Chances are it lacked seasoning, it had a mix of spices that didn't go well or it had too much seasoning. This online cooking lesson will have you cooking a vegetable soup to experiment with seasonings and try several different methods of adding flavor to food including dry rubs, marinades and more. Spices, whether it is simply salt and pepper, add flavor to your cooking that finishes off the dish. You can use dry spices that are bottled or fresh herbs. Use 3 times more fresh herbs if you are substituting fresh for dried. How to successfully use spices in cooking is acquired mostly by cooking, experimenting and often times following the recipe. I like to use this recipe for teaching about how important adding spices to cooking is. 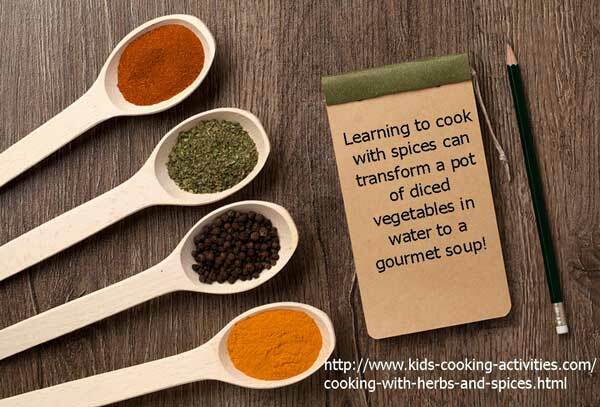 It is a lot like the story of Stone Soup, you add whatever vegetables or meat you have on hand. Allow to cook 20-30 minutes. Taste the vegetable soup again and see if you'd can tell if it needs any more flavor. You can add a little more if you think it needs it. Cook until all vegetables are tender. Tasting soup or other "safe dishes" while cooking is key. It helps you know what your soup might need. As you continue to cook, you'll learn quickly if it needs more salt, pepper, parsley or other seasoning. When cooking meat, season while browning with chopped onions, salt and pepper. This add lots of flavor while it is cooking. If I'm adding ground meat to spaghetti sauce or an Italian type dish, I add 1 Tablespoon Italian seasoning while it is browning. If adding to chili, I'll add chili powder or taco seasoning while I brown ground hamburger or ground chicken. There are several ways to season or add flavor to food. When cooking remember to start with a little seasoning and add as needed. You can always add more if needed but too much you can't always fix. 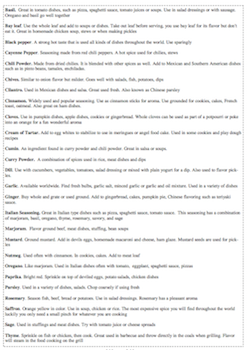 Print off a spice and herb chart for your kitchen. Some good recipes to taste test spices. Taste the difference before and after adding spices. Taco soup-The flavor of your soup will be pretty bland until you add your Taco seasoning which is where all the flavor comes in. Spaghetti Sauce- Italian seasoning, Oregano, parsley, and Basil all add flavor to the sauce. Without them your sauce will just taste like tomatoes with no flavor. Homemade Chicken Soup-Adding a Bay leaf when you boil your chicken not only flavors the chicken meat it will give a wonderful aroma to your kitchen. Shred chicken and add 1 Tablespoon soy sauce. Taste test. Now sprinkle 1 teaspoon ginger and 1 clove of garlic. You can add a bit more ginger or garlic if you would like. This is where the experimenting comes in adding and tasting until it turns out how your taste buds like it. Open the wonton wrappers and dip your fingers in water. Brush sides of wrapper with wet fingers. Add a teaspoon of chicken mixture in the middle and fold in half. Deep fry or cook in hot chicken broth. Having fresh herbs growing in your backyard or kitchen windowsill is not only fun but helps in your cooking. Learn how to grow your own herb garden and how to use fresh herbs. Dry spices and ingredients that are mixed together and rubbed over meat is called a dry rub. This method of cooking with herbs and spices works on roast chicken, beef or pork roast and meat. 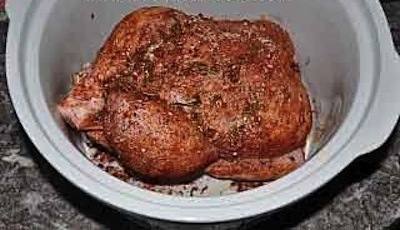 Try this Spicy Roast Chicken recipe. This method to cooking with herbs and spices is great for chicken and beef. A marinade is a mix of liquid ingredients. It is best poured into a Ziploc bag or glass container with a lid. Add meat and marinade in the fridge at least 1 hour-4 hours. Prepare chicken marinade and place in the fridge in the morning. Then mix together your peanut sauce and store in fridge as well. In large measuring cup, add orange juice, soy sauce, honey, garlic and ginger. Blend together and pour into large Ziploc baggie. Add drumsticks and marinade several hours in the fridge. Mix three ingredients together and store in a bowl in the fridge until ready to use. 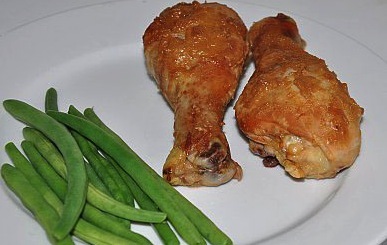 At dinner-time take out chicken drumsticks and place in a casserole safe dish. Cook for 15 minutes. Pour peanut sauce over the top and continue to bake 15-20 minutes or until chicken is tender and no longer pink. You can even go beyond cooking with herbs and spices and use condiments such as BBQ sauce, chili sauce, spaghetti sauce, Italian dressing and many common other ingredients found in your fridge that we often use as dips can also be used to cook your meals. Place meat in baking dish and pour condiment over top. Bake. 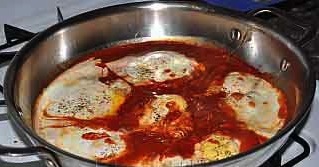 Simmer spaghetti sauce in bottom of a skillet several minutes. Crack an egg for each person of the family into the sauce. Season with salt and pepper and allow to cook several minutes until eggs are cooked through. Serve with garlic toast. This applesauce pork chops in the crock pot, makes moist pork chops that will taste great as a main dish. Add ingredients together in a Ziploc baggie. Marinate for 1 hour. Bake or grill. Add to lunch box in the morning. Share your cooking with herbs and spices recipes and tips.